There may be cases when you need to generate random numbers in Excel. For example, to select random winners from a list or to get a random list of numbers for data analysis or to create random groups of students in class. In this tutorial, you will learn how to generate random numbers in Excel (with and without repetitions). 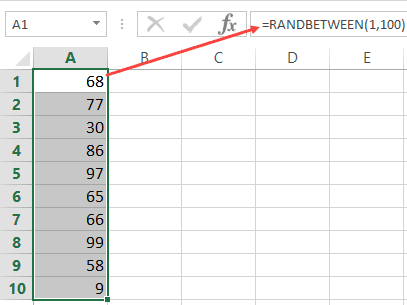 There are two worksheet functions that are meant to generate random numbers in Excel: RAND and RANDBETWEEN. RANDBETWEEN function would give you the random numbers, but there is a high possibility of repeats in the result. RAND function is more likely to give you a result without repetitions. However, it only gives random numbers between 0 and 1. 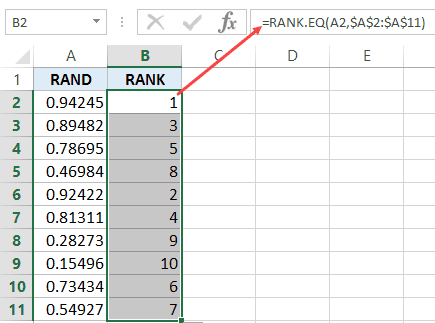 It can be used with RANK to generate unique random numbers in Excel (as shown later in this tutorial). 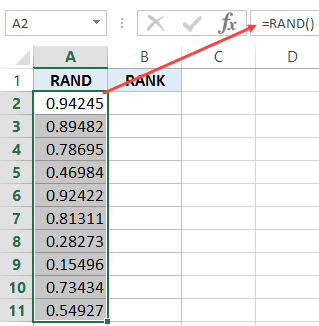 Excel RANDBETWEEN function generates a set of integer random numbers between the two specified numbers. RANDBETWEEN function takes two arguments – the Bottom value and the top value. It will give you an integer number between the two specified numbers only. For example, suppose I want to generate 10 random numbers between 1 and 100. Select the cell in which you want to get the random numbers. In the active cell, enter =RANDBETWEEN(1,100). This will instantly give me 10 random numbers in the selected cells. While RANDBETWEEN makes it easy to get integers between the specified numbers, there is a high chance of repetition in the result. For example, when I use the RANDBETWEEN function to get 10 random numbers and use the formula =RANDBETWEEN(1,10), it gives me a couple of duplicates. 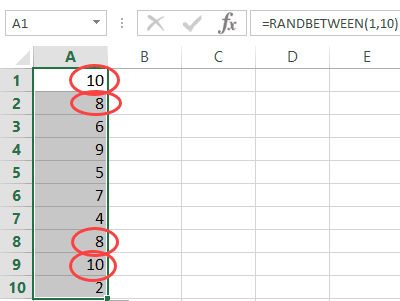 If you’re OK with duplicates, RANDBETWEEN is the easiest way to generate random numbers in Excel. Note that RANDBETWEEN is a volatile function and recalculates every time there is a change in the worksheet. To avoid getting the random numbers recalculate, again and again, convert the result of the formula to values. I tested the RAND function multiple times and didn’t find duplicate values. But as a caution, I recommend you check for duplicate values when you use this function. Suppose I want to generate 10 random numbers in Excel (without repeats). Select the cells in which you want to get the random numbers. Select all the cell (where you have the result of the RAND function) and convert it to values. Now you can use the values in column B as the random numbers. Note: RAND is a volatile formula and would recalculate every time there is any change in the worksheet. Make sure you have converted all the RAND function results to values. Just a trick, RAND and RANDBETWEEN are volatile functions, so each time there’s a change they will be updated. To avoid this, you can create a Pivot Table referencing the cells with the random values (functions) and then reference the Pivot Table values. This way the random values won’t change until the Pivot Table is updated.